Our life, our happiness and the very font of our desires are discovered and displayed as we connect with our personal essence. For those seeking greater happiness but have never thought about their own essence, consider the concept now. Essence is described as the quality or qualities of a thing that give it identity. It relates to something spiritual rather than tangible and feels something akin to one’s unique aroma or scent. The ancient roots of essence find their meaning in the Latin word esse, meaning, simply, to be. In a chaotic world consumed by externalization — busyness at work, frenzied commitments, conflicts on all sides — it’s easy to lose touch with our simple state of being. Not surprisingly, it’s that inner being the leads us to the essence of our life and the source of our joy and satisfaction. Searching for a photo that captured my own essence, the above image immediately came to mind. That’s me third from the left, a smiling preschooler standing with excitement among neighborhood friends and my younger brother. As I look back to my earliest years, it’s easy for me to connect with my essence. I felt most joyful, most alive and at my most natural when surrounded by other people. 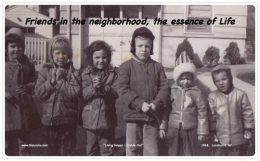 Playing in our neighborhood cul-de-sac with friends was golden, going to kindergarten to meet new classmates, and attending large family gatherings filled my heart with an inner sunshine. Daydreaming about meeting friends from other parts of the world also filled me with wonder; for me, there material replacements could not compare with being in the presence others. The words of ancient Chinese philosopher Mencius in the above quote captures the essence of who I am. I see others as distant relatives or, more specifically, as siblings God never gave me. Whether writing, speaking, engaging with or interviewing others, everything I do today finds its source and inspiration from that simple essence. If you’ve been feeling empty, exhausted or dis-spirited, I hope you listen in to my latest podcast. In it, I talk more about essence and offer a few ways in which you can access your own! Click the bar below or right here to listen to podcast 102: Following the Essence of Your Life. Find and follow your own essence and, in doing so, discover your own breath of happiness and life!